It's not a diet it's a lifestyle! I have recently learned how to make chips in the microwave with no fat. Yes, you read that correctly. 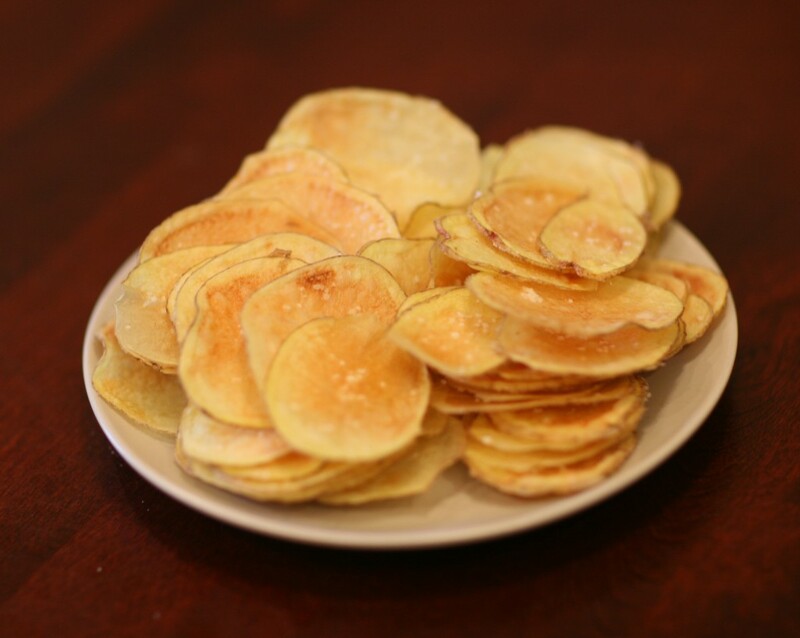 Make your own fat-free potato chips from real potatoes! I was listening to ATK Radio a while ago and they spoke about a gadget that cooks potato chips in the microwave which they tried with success! I was so intrigued I just had to try it for myself. What I ended up getting, were two silicone trays that are covered with a variety of holes. 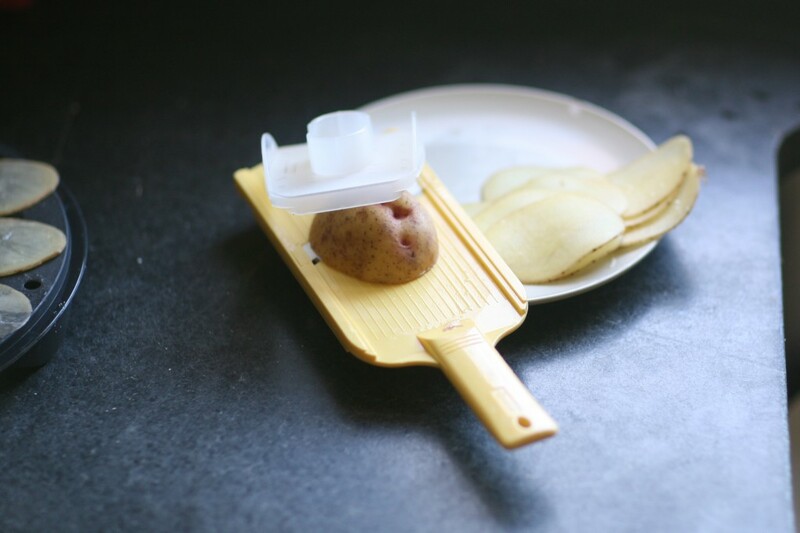 All you do is thinly slice your potato and spread them out on the trays in a single layer. Microwave for about 3 minutes and you get some crispy delicious chips! It also works wonderfully with sweet potatoes and supposedly also works with carrots, beets, parsnips, apples, pears and mangos, although I haven’t tried those yet. Since I do not like to promote any particular products, I’ll tell you that a quick google search lead me to some posts about doing this same thing with paper plates, glass plates (they used cooking spray) and parchment paper. I tried it out with parchment paper and got very good results. The only things you need to be careful about are the moisture that will accumulate on the parchment as the chips cook and cool (which makes for a soggy chip) and also getting the potato slices on parchment in and out of the microwave is a little trickier. 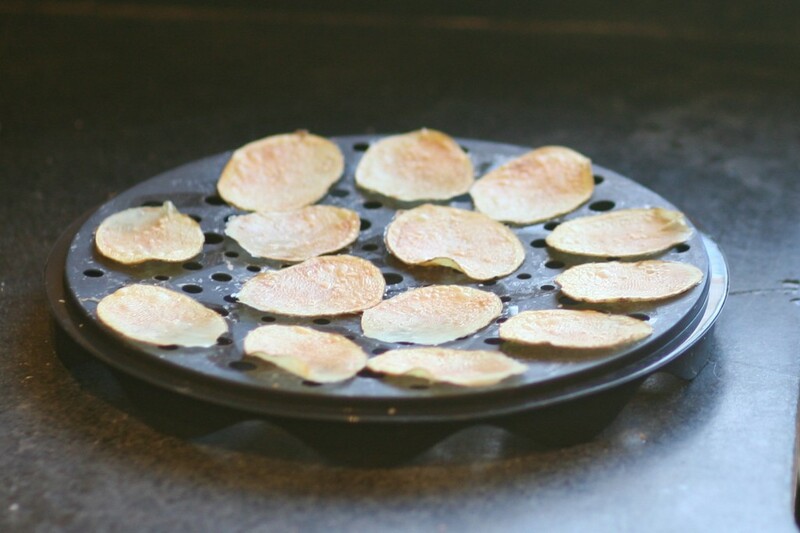 Making your own chips couldn’t be simpler! Step1: Thinly slice potatoes. 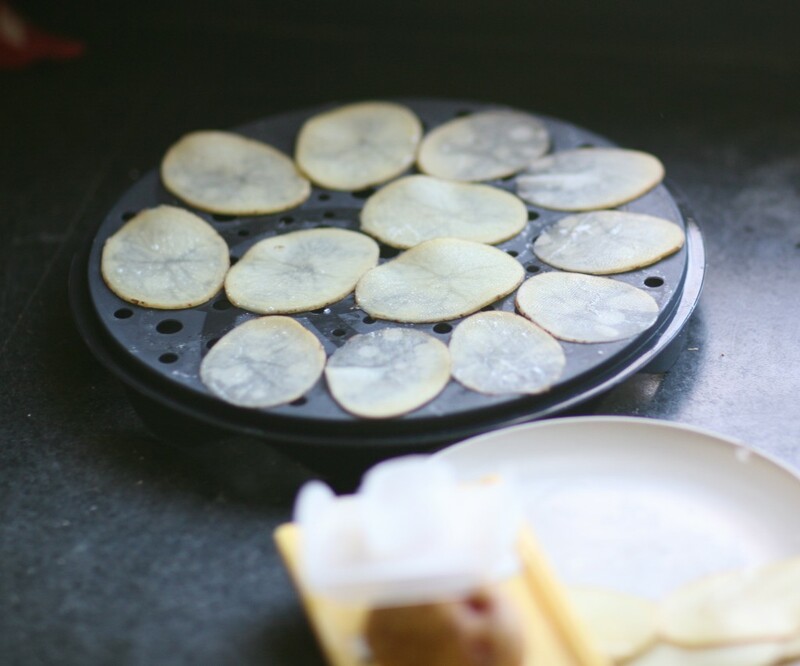 Using a mandoline will make this a lot easier and will ensure even sizing for even cooking. Step 2: Place potato slices on tray (or parchment) and season as desired. The package instructions said to season after cooking, but then the chips are dry and seasoning doesn’t stick. This is where you can get creative and make your chips unique. Step 3: Cook in the microwave at high power for about 3 minutes. Each microwave is different so you may need to cook them longer or shorter, make sure to watch them. Step 4: Enjoy your delicious crunchy homemade chips! This entry was posted in Uncategorized by elise. Bookmark the permalink.